Roger Querrin was determined to face the curse that has plagues his family so is determined to spend the night in a locked and guarded room. Guess what normally happens to people in the family who did that? And despite Querrin’s brother Peter enlisting amateur detective Algy Lawrence to help protect Roger, it’s rather inevitable that Roger ends up stabbed in the back in a room securely sealed from the inside and guarded on all sides. When a second similar impossible murder takes place, Algy is seemingly at a complete loss as to how the murderer could have possible gained access to the victims – and escaped without being spotted – presuming, of course, that someone hasn’t managed to whistle up the devil himself. 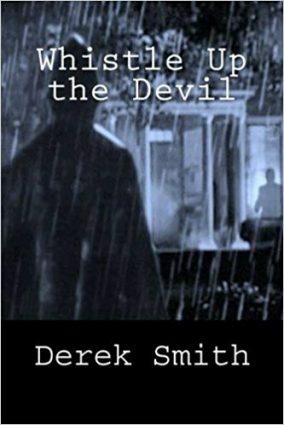 Derek Smith only had this one locked room mystery published in his day, but wrote two others which have been released in a single edition, The Derek Smith Omnibus by those nice folks at Locked Room International, as well as individually. But let me start with a moan. The Kindle edition is annoying. I’ve noticed before that the LRI kindle editions don’t have a working chapter index – this can be a pain, but it’s not the end of the world. But when there seems to be no way to jump to a particular book in a file that contains three different works along with other bits and bobs, then the lack of such navigations is really annoying. Hopefully this can be fixed with future titles. But back to the book – I’ll take a look at the others, Come To Paddington Fair and Model For Murder at some point in the future – and it deserves it reputation as a something of a classic. It’s a lively read, only getting a little bogged down towards the middle, before picking up speed again thereafter. The solution is a little complex but still clear and Smith lays out the clues for the reader, doing a good job of showing how Algy worked everything out from what was presented, although I doubt many people would spot it the first time round. It is an atmospheric read, despite never really playing up the supernatural elements – while we wouldn’t expect Algy to believe that evil spirits were involved, you might expect, for example, Peter, who after all summoned protection for his brother, to espouse a supernatural theory, but despite the impossibility of Roger’s death, the legend that he was in danger from basically fades from the narrative. Having said that, the book does invoke what is probably my least favourite crime fiction trope and yet does enough to get away with it, possibly the only time that I’ve seen it work convincingly. One oddity though – there are plenty of references to the classic works of detective fiction throughout the story, as Algy seems to have read and memorised everything, but it seems that one set of stories, those of The Great Merlini, are based on real events, in this universe at least. Definitely a classic that needs to be more widely read and a real shame that Smith never published anything further, but on the strength of this, I’ll be taking a look at Come To Paddington Fair very soon. Highly Recommended. For more on Derek Smith and the book, do take a look at Patrick’s post over at At The Scene Of The Crime – far more informative than what I’ve just written. Hey, thanks for the shoutout at the end! I’m not as active as I once was but I enjoy reading reviews when I get the chance. Glad you liked this one. It’s unfortunate about your issues with the Kindle version: I read this as a physical book before the e-edition was published, so it never came up for me. I enjoyed this one a lot. The follow up, Come to Paddington Fair, is good but not quite at the same level IMHO. Model for Murder is a Sexton Blake novel, but was perhaps too much of a cerebral detective story for the series and it never got published during Smith’s lifetime. However, while not as good as his other impossible crime novels, it’s probably still the best Sexton Blake novel ever written. Thanks for the review, which made me glad I got the omnibus in hard copy. I’ve only read “Whistle”, which I very much enjoyed. It struck me that Smith, rather than Carr, was the forerunner for Halter – the somewhat abrupt and thin characterisation counterbalanced by a pleasingly convoluted set-up. I’m wondering what “tropes” you’re referring to when you speak of your “least favourite crime fiction trope”. I can think of at least two possibilities…! There is another trope which is also used in a Hercule Poirot novel. That is why perhaps JFW wanted a clarification.. I thought and thought about the trope you dislike and couldn’t figure it out. Is it Murder by SPOILER or Murder by SPOILER? Above comment edited for spoilers sake. Puzzle Doctor has already given a very big hint that it is used in consecutive Poirot books in the early 1930s ! Have just finished reading the Kindle version which is very annoying to use and has a number of typos. At the moment I feel “Come to Paddington Fair” is better than ” Whistle”. I found some of the writing in “Model for Murder” irritating. Overall, the plots are superbly well done but I thought the writing did not match their quality.